I read Caimh McDonnell’s hilarious debut A Man with One of Those Faces last year and loved it. You can read my review of that here. 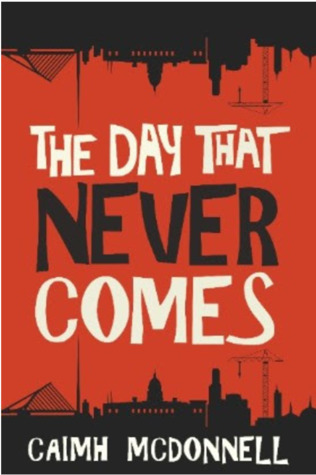 His follow-up, The Day That Never Comes, is just as brilliantly funny while still being a cracking crime novel. The novel features three of the protagonists from the first novel: the rather hapless Paul Mulchrone, nurse Brigit Conroy and Bunny McGarry. Following their escapades solving the Rapunzel case, they have decided to set up in business as a private investigation agency. There is just one problem – well more than one actually. Brigit won’t speak to Paul following a drunken incident, Bunny has disappeared off the face of the earth and they can’t get a licence to run the agency without him. The trial of three businessmen has just collapsed, swiftly followed by some rather unpleasant murders and it looks like some underground organisation is trying to dispense justice for the underdog. As Paul tries to track down Bunny, it seems that he may have links to the murdered men but surely he hasn’t turned into a serial killer? Flashback chapters reveal to the reader just what Bunny’s connections are to these men. Could his colourful past be catching up with his colourful present? This was a terrifically entertaining read with plenty of action keeping the story rolling along at a great pace. Don’t let the humour fool you into thinking this is some lightweight cosy crime. There are serious ‘baddies’ you would not want to mess with and more than one scene which had me wincing. But the humour balances this beautifully and Caimh McDonnell has a great turn of phrase giving his characters sharply witty lines. Bunny’s dry humour and one liners had me snorting with laughter on more than one occasion. I must make special mention of Paul’s canine companion Maggie. Now I’m not a dog lover (sorry if you are!) but she is just a brilliant addition to the book. She is completely unpredictable, doing her own thing but fiercely loyal to Paul – and just fierce to everyone else! I really think that both books would make brilliant tv series and was thinking about who I would cast as the main characters. I think Colin Farrell is a definite to play Paul, Brendan Gleeson would make a fantastic Bunny, with Evanna Lynch as feisty Brigit. Whether they ever get optioned for the big or small screen or not, I know I’m going to want to see more of these three on the page. So roll on the final part of the trilogy! My thanks to Elaine at McFori Ink for my copy of the book. The Day That Never Comes was published yesterday. To celebrate publication of the second book, you can buy A Man WIth One of Those Face for only 99p/99c from 23rd-30th January. Buying links below. Caimh has kindly written a guest piece about his rather unusual research experience while on his honeymoon! One of the classic writing maxims you hear bandied about is ‘write what you know’. I’ll be honest, I’ve never understood that. Science fiction is a whole genre more or less defined by writing about what you don’t know and, while there are many ex-cops and even a few ex-robbers that do write crime novels, I don’t think we all have to put a stint in working for CID or rob a bank before we get to have a crack at it. It seems to me, a much more sensible approach is to try and know about what you write. That’s easier said than done, of course. Sure, I can and have walked around Dublin with a pad and pen planning a riot out in great detail, but other things aren’t so easy. Guns for example. In a modern crime thriller, the odds are better than good that somewhere along the line, someone is going to pack some artillery and as an author, you need to describe in convincingly. Now, there is a certain genre of books where the detailed and loving explanation of weaponry seems de rigueur. Frankly, the last time I read a Tom Clancy novel, there was such a lovingly expressed explanation of military hardware that I was tempted to Google whether he was in a long-term relationship with an aircraft carrier. Still, Tom and his fact attack is all well and good if that is what floats your second fleet, but my concerns were a little more basic. What does a gun feel like? How can I give a sense of realism to my explanation of what being stuck at either end of one is like, if I’ve never been near one. The above is essentially the explanation my wife fell for which meant we ended up going to a gun range in Florida on our honeymoon. Don’t judge me, it was invaluable research! My instructor was called Todd, as was everyone else in the range, even the female staff. Also, for people with access to a vast amount of weaponry, they were all surprisingly muscular. My guess is they were in training in case they ran out of bullets and needed to finish off the last few communists/zombies hand-to-hand. They were very friendly, polite and had an American flag made out of bullets. The most surprising part of the experience was that those spent bullet shells are hot and get everywhere, including occasionally bouncing off your face – hence the goggles. I did ask Todd if that didn’t represent a terrible health and safety risk – all this hot metal could start a fire. I’m pretty sure he and the other Todds had a good laugh about that when I left. They’ll be sorry when they’re all trapped on top of their burning building with their arsenal of weapons, waiting for a man with a hose to come save them. When I was signing up, the Todd behind the counter asked me if it would be just me shooting. I explained it was, my wife was a spectator (by which I mean she spent 30 minutes taking pictures of flags made out of bullets and looking truly horrified at the 12 year old whose parents were ‘letting him get his gun on’ for his birthday.) Then another of the Todds asked again if it was just me. A few months later, I think I’ve figured out why. Apparently, Irish and British criminal gangs, who have plenty of weaponry but nowhere to practice using it, are known to quite regularly take trips to Florida to receive perfectly legal weapons training. They call them ‘shooting holidays’. They often combine it with a family trip to Disneyland. Now that really is unreal. So, what did I learn? Well, I now know that guns are bloody loud, quite heavy and a lot of fun. So much fun in fact that I think I’ve found the new anti-gun slogan they should use. Guns – don’t get one, they’re such a hoot, you’ll be dying to use it. I still need to get his first book! This one sounds just as much fun! Well it’s a bargain just now but only for this week so now’s the time! Haha! Better get a move on, then. Ditto on the casting. I’ve never thought of anyone but Brendan Gleeson for Bunny, and Evanna for Brigit definitely. Wouldn’t it be a brilliant film? That flag is made of cartridges. I am available to proof read in future ….. !